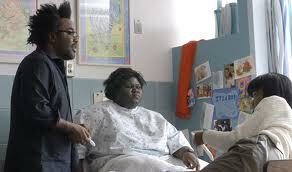 Director Lee Daniels on the set of "Precious" with star Gabourey Sidibe. Filmmaker Lee Daniels had modest aims when he brought his new drama, then called "Push: Based on the Novel by Sapphire," to the Sundance Film Festival earlier this year. He was just hoping to score a DVD deal with a company that could target black audiences. But his representatives were convinced they could get big dollars from a top distributor. As Daniels prepared to introduce his film at a screening, all the major buyers were still a mile down the road at the splashy premiere of "Brooklyn's Finest." His agent Charles King asked Daniels to stall. "I was sweating bullets," Daniels says. "After 20 minutes, everybody that they felt needed to be in the room was in the room. I don't think (Weinstein Co. principal) Harvey Weinstein was there, but maybe some of his people were. The agents gave me the thumbs, and then we began." The screening kick-started one of the most compelling stories of this awards season. When the end credits rolled nearly two hours later, Daniels was greeted with a tearful standing ovation. Then came a flurry of negotiations, with Weinstein Co. believing it had purchased worldwide rights to the film. But days later, with Oprah Winfrey and Tyler Perry on board as executive producers, Lionsgate said it had bought the film for about $5 million. That touched off a bicoastal legal brawl still winding its way through the courts. "It got nasty," Daniels says. "I got a little depressed about it because I felt like, just when things are good ...."
For Daniels, Sundance was far from the beginning of his "Precious" drama. He was given the book a dozen years ago by friend Charlotte Sheedy, the mother of actress Ally Sheedy and a literary agent for the poet who calls herself Sapphire. When Daniels finally cracked the cover, he devoured the first-person narrative in one sitting and decided he had to bring it to the screen. But he was a talent manager at the time with no experience making films, and his initial meeting with the author did not go well. "I said everything wrong, so she sort of had her people say no," he recalls. But Daniels "stalked her," he says, as his career as a filmmaker blossomed. After producing the critical hits "Monster's Ball" (2001), which earned a best actress Oscar for Halle Berry, and "The Woodsman" (2004), he tried his hand at directing with the 2006 outre film noir "Shadowboxer." The movie was a critical and commercial disappointment, but he managed to convince Sapphire he was the man to bring "Push" to the big screen. All he needed was financing. Because the subject matter -- an obese teen, pregnant for the second time by her father, seeks to escape her abusive mother -- made studio support out of the question, he decided to forgo traditional Hollywood sources. "I had such a hard time with 'Monster's Ball,' and an even harder time with 'Woodsman,' that I never even bothered to go that way," Daniels says. Instead, he turned to an unlikely source: Sarah Siegel-Magness and Gary Magness of Smokewood Entertainment. The Denver-based couple's only film credit was executive producing 2008's "Tennessee," which Daniels produced. She is the daughter of the founders of herbal-tea giant Celestial Seasonings and creator of the So Low fashion line; he is a cable magnate and cattle baron. Needless to say, the Magnesses were not among the likely audience for "Precious." But "the triumph and pain" of the story are "universal to everyone," Siegel-Magness says. "That's really why it appealed to my husband and me." The Magnesses pledged to cover the $8 million budget (which eventually grew to $10 million) and joined the project as producers. After commissioning a script from screenwriter Geoffrey Fletcher, Daniel still had to find an actress to play Clarice "Precious" Jones. Because of the youth and size of the character, there were few actresses to consider from the professional world, so casting directors Billy Hopkins and Jessica Kelly held open calls at schools nationwide and solicited taped submissions. "We looked at about 400 kids," Hopkins says. "If the girl had any glimmer of acting skill or natural ability, we continued to work with her." Eventually, the candidates were whittled down to 10 girls who participated in an acting "boot camp" with Daniels during summer 2007." Some had this attribute of Precious or that attribute of Precious, and as the weeks went by, some fell by the wayside," Hopkins says. With a September start date looming, "Lee still wasn't completely satisfied, so we had to start all over again." A series of open casting calls were arranged at New York-area community colleges. At Lehman College in the Bronx, Hopkins was getting ready to call it a day when he spotted one more girl waiting in the lobby. It was Gabourey "Gabby" Sidibe, then 24. Not only did she look the part and play it convincingly, but out of character she was sharp and relaxed. "There were other girls that were great, but they were Precious," Daniels explains. "If we were doing press or something, they would've said, 'Oh, this poor little girl. This is her story.' And it ain't Gabby's story. Gabby is smarter than me, that's for sure." Sidibe says she wasn't nervous during the audition process because she was convinced there was no way she'd get the part. Her attitude changed three weeks later when, after a series of casual rehearsals with Daniels, she was thrust into scenes with co-stars Mariah Carey, Lenny Kravitz and Mo'Nique, all of whom had agreed to play decidedly unglamorous roles. Sidibe says she was most intimated by Paula Patton, who plays Precious' teacher, Ms. Rain. "I had to cope with my fear of her by making jokes all the time," Sidibe says. "I think the first time she was actually shooting on set, I said something like, 'Yeah, the real actress is here.' And she got so mad at me. She said, 'You are a real actress. Never say that you are not.'" Daniels found some crew members to be less endearing. During the eight-week shoot in Harlem, he had to fire an editor, a cinematographer, three continuity people, three location managers, two producers, two assistant directors, two sound people, two video-playback operators and two caterers. "I don't think some of the crew really understood where I was going with the film," Daniels says. He also thinks shooting in New York was part of the problem. "There are so many famous directors and so much activity there for production, sometimes people just look at it as a job," he says. "I found that deeply offensive." These days, Daniels is in a much better mood. "Precious" pocketed the audience awards at Sundance and Toronto on the way to its awards-season buzz. Last month, a judge in New York shot down the Weinstein Co.'s claim to the film, and Daniels hopes the court in Los Angeles will follow suit. Meanwhile, Winfrey has started promoting "Precious," and she and Perry are planning a full-court press in the lead-up to its November 6 platform rollout. It's a remarkable run for a film that less than a year ago was unknown and unwanted, much like its title character. "Dude, I'm telling you, it's a fairy tale," Daniels says.